GPone crash knobs are made from the highest grade Delrin and will protect expensive fairings in the (unlikely) event of a spill. They also have CNC machined supports/strengtheners and super strong Allen head bolts. They will fit most bikes. 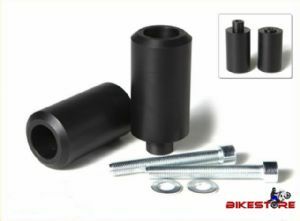 To fit, simply screw into an available mounting point on the bike's frame. Some cutting of fairings may be required. Priced as a set of two crash knobs.